Place the potatoes in the bottom of an oval slow cooker. Top with chicken. Season well with salt and pepper. Pour the chicken broth over and add your choice of flavor enhancer. Top the chicken with the herbs. Turn the slow cooker on low. 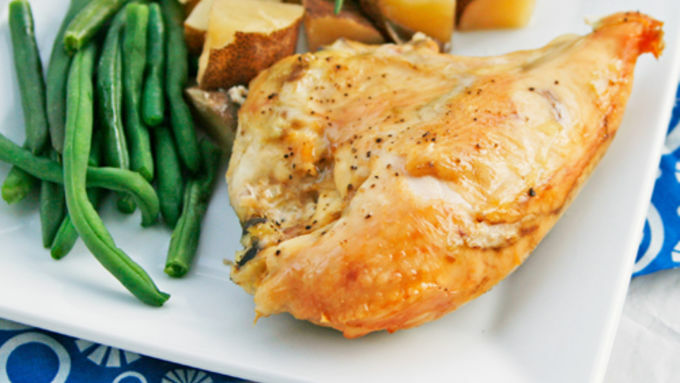 Cook for 8-10 hours, until the chicken is tender and cooked through. Serve with a vegetable such as frozen green beans. Toss a few tasty ingredients into your slow cooker in the morning, and when you come home after a long day, you'll thank yourself. Are you busy? Like really busy? Like pulling your hair out and counting the minutes until you can shed your clothes and curl into the warmth of your bed busy? Me too. It’s no wonder that by the time dinner rolls around, I just want it on the table – without any fuss or prep. Just ready to go. That feeling makes me adore my slow cooker that much more. 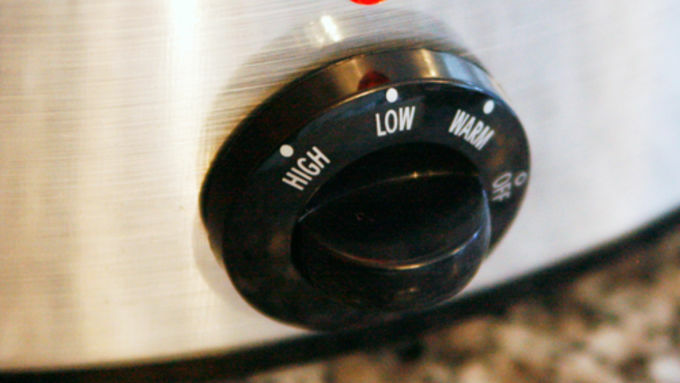 When you use a slow cooker for dinner, it takes a mere 10 minutes (or less) in the morning to toss dinner together. I can make 10 minutes appear in my morning for that for sure. 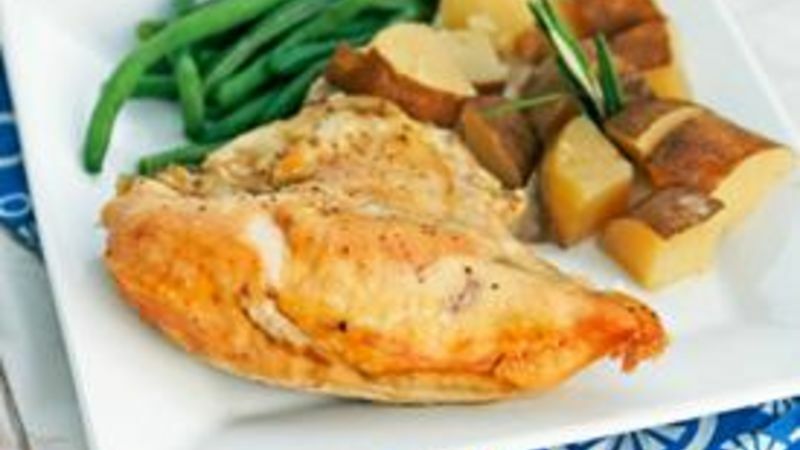 Slow Cooker Herbed Chicken and Potatoes is a perfect example of a toss it in and go dinner. All you have to do is cube a few potatoes (so fast!) then you toss them in the slow cooker and top then with the chicken breasts, herbs, salt and pepper and chicken broth. Set that baby to low and you are ready to go. The flavor is amazing because the ingredients meld together. The herbs infuse the chicken and potatoes with earthy, bright flavor while the tender potatoes develop an irresistible silkiness to them. Make this one a meal by pairing it with some Green Giant Streamers Grean Beans – or your favorite veggie. 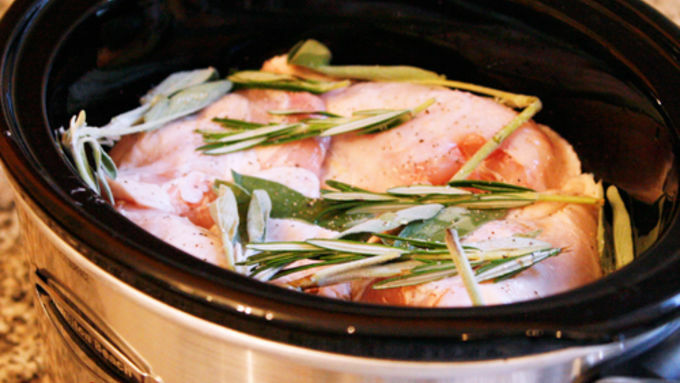 Slow cooker recipes are a true lifesaver at busy times of the year like these. Here are a few more recipes to try for your family.